Yes! 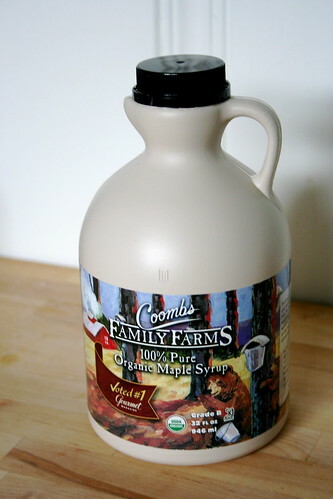 The Coomb’s Organic Maple Syrup I won from Ricki at Diet, Dessert, and Dogs arrived in the mail this week! I, for one, am a maple syrup fiend. Recession or no recession, I refuse to give it up. Some people think it’s over-priced and overrated, but not me! Where would I be without my maple glazed brussels sprouts? Or weekend pancake brunches? Or maple sweetened desserts? Now I haven’t tried the syrup yet because I have an opened quart of New York maple syrup that I bought in Cuba, NY over Christmas, but as soon as I finish that, it’s on to taste-testing the Coomb’s! Now to the recipe. It’s no secret how much I (and everyone else in the blog world) adores Heidi’s recipes over at 101 Cookbooks. If it weren’t for her my diet would be a bit more boring, I think. So when Heidi posted a recipe for Jamaican Veggie Patties in March, I immediately bookmarked the page and put it at the top of my to-make list. The first chance I got I bought all the veggies the recipe called for, raced home, put the groceries away, pulled out the recipe, and then realized that, oops, I’d forgotten the coconut oil. Granted, I could have made it with vegetable oil, but I figured something would be missing in the end result. I’m really glad I waited to make the recipe until I bought the coconut oil! The scent of melting coconut oil is intoxicating. Mixed with onions and garlic, it’s even more delicious. I followed the recipe to a T, except I used purple potatoes instead of yellow ones because I couldn’t resist the purpley goodness of the little tatters. Now I’m wishing I’d used them in a potato salad for tomorrow, but oh well. I can’t win it all! The end result was de-lic-ious. They do need a dipping sauce, something Jamaican, but I made do with an Asian garlic chili sauce: sweet, spicy, garlicy. The poet gave these a two thumbs up, and I agree. It was definitely worth the wait! In a medium-size saute pan over medium-low heat, combine the coconut oil, the onion cinnamon, allspice, cumin, red pepper flakes, cayenne, and 1/2 teaspoon of salt. Saute, stirring occasionally, for 8 to 10 minutes, or until the vegetables are caramelized. Stir in the coconut milk, carrots, and potatoes, reduce the heat to low, cover, and cook until the carrots and potatoes are tender, 10 to 12 minutes. Stir in the green peas, corn, cabbage, thyme, and lemon juice, cover, and cook for 3 minutes more. Season with additional salt and the white pepper (or to taste) and set aside to allow the flavors to marry. Combine 1 1/2 cups of the white flour with the pastry flour, turmeric, and salt in a food processor. Set the remaining 1/4 cup white flour aside. Add the coconut butter to the flour mixture pulse until it resembles fine sand. Combine the vinegar and water and mix well. Place the flour mixture in a large bowl. Then, without overworking the dough, add the vinegar mixture by the tablespoon, while stirring, just until the dough comes away from the sides of the bowl and begins to coalesce. Squeeze into a tight ball, flatten, cover in plastic wrap, and refrigerate for at least 1 hour. How adorable! They sound delicious! Those patties are so cute & delicious sounding (hey, like you! ), and woooooootttt for Maple Syrup love à la Ricki! There are few things more important in life than using real maple syrup. I never understood why the fake stuff even exists. Those patties look fabulous! And I’m so glad you got the syrup–yay!! Be sure to save a wee bit of your first jug before you open the Coombs–I’m dying to hear the results of the taste comparison! Hope you had/have a wonderful holiday! awesomeness! i recently discovered that coconut oil even existed…i like using it. i bet these are really good. YAY for maple goodness! Maple syrup makes the world go round. The patties look so yummy perfectly shaped! They remind me of empanadas. YOU are envious of MY talent? Blasphemy! You take the best pictures ever! They really looks delicious but as a Belgian I’m not very familiar with maple syrup. I’m even wondering if we can buy it overhere. Anyway I have never seen it. So jealous of your maple syrup! There are few sweet ingredients I love more, it’s just such a shame that it’s become so expensive these days… I can’t wait to see what you do with it though! Awesome savory pastries, they sound so flavorful! I love food in pockets – they look delicious! Those patties look gorgeous! And congrats on winning the syrup. i use maple syrup very scarcely cuz it is so expensive but i do love it! i am envious of your huge jug of it! those look amazing and wonderful in every way! and congrats on your maple syrup win. you are one lucky, lucky girl! also, that korean soup from the previous post sounds great…can’t wait to try that one as well! 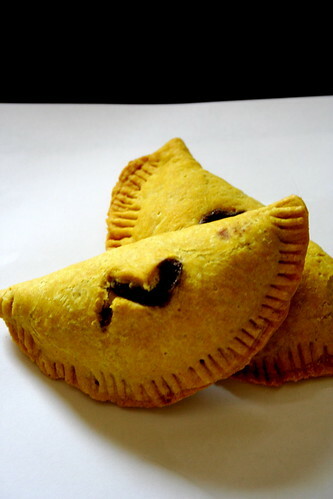 i think i’m gonna have to make those jamaican veggie patties – they sound glorious and look amazing, Jes! we have a jar o’ coconut oil that i need to dig into some more! superexcitedface! i hope some day to find some of those rock’n purple taters, too! That sounds SO awesome. Man! I wish we had some maple syrup! Mmm. I love Jamaican food. jamaican patties are also good stuffed with callaloo. your dekalb farmer’s market has the traditional amaranth greens sometimes. The spices in Jamaican food rock! Those patties look wonderful. I grew up eating maple due to my neighbor. It’s so pricey these days that I try to stretch my bottle out. I am pretty sure these would complement my lunch nicely. They look/sound delicious!